KIEV, Ukraine -- Trash bucket challenge spreads across Ukraine as activisits throw politicians into rubbish bins to 'punish corruption'. The war in the east refuses to end, despite a “ceasefire”. Winter is approaching, and with it all the worries of another “gas-war” with Russia. And with parliamentary elections just weeks away, pre-revolutionary MPs are getting nervous about hanging on to their jobs. To make things worse, there is a growing chance of ending up in a trash bin. The perpetrators - often members of the radical right-wing group Right Sector - say the public humiliations are to punish the corruption and criminality that characterised the previous regime. But critics warn the attacks are just one step away from mob justice and public lynchings. “The main thing in our country now is that the criminals are all still there,” said Yury Mindiuk, the head of Right Sector’s central executive. Right Sector emerged as an alliance of far right groups during the revolution, and earned a fearsome reputation as one of the most militant elements in the street fighting that led to Yanukovych’s overthrow. Since then some members of the group have fought in the war in eastern Ukraine, but they have struggled to find political relevance in post-revolutionary politics. 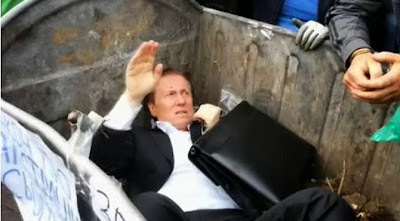 It was the group’s Odessa branch that came up with the idea last month, when they dumped Oleg Rudenko, a city insurance official accused of taking a £28,000 ($45,000) bribe, in a trash can. The stunt hit a chord. Soon Right Sector groups across the country were doing the same thing to anyone from MPs with links to the previous regime through to local municipal officials accused of taking bribes. On September 16 a mob grabbed and “binned” Vitaly Zhuravsky, an MP formerly of Yanukovych’s now defunct Party of the Regions. On September 25 it was the turn of Viktor Pylypyshyn, another Party of the Regions man. In both cases activists seemed most upset about their support for repressive package of laws Yanukovych rushed through parliament in a doomed bid to crush the anti-government protests in December. But it is not just MPs linked to Yanukoych who are in danger. In the most recent incident on Right Sector’s website features a doctor from a municipal hospital in the small town of Terebolvya. The group says he was convicted of bribery three months ago. The tensions underlying the practice go back to last winter’s revolution. When protesters swept over the 18ft high walls of Viktor Yanukovych’s out of town residence after he fled on February 22, they found an estate half the size of Monaco replete with private zoo, classic car collection, and a now infamous mock-galleon restaurant moored on the river. The clubs at the private golf course were embossed with Yanukovych’s initials. It was a jaw-dropping demonstration of the scale and depth of the corruption that had angered so many protesters. Seven months on, Yanukovych is long gone, and the estate has been returned to public ownership. But many feel the deep rooted political culture of personal enrichment and corruption it represents - and which the revolution was meant to put an end to - endures. A so-called “lustration law,” which would subject national and local officials to screening for corruption of other wrong doing, was passed by the Ukrainian parliament in August. But no one has yet been subjected to the checks, let along lost their job under it. To make matters worse, the Prosecutor General last week warned that the law is unconstitutional and violates international law. “Put them in jail, legally. Clean up this so-called establishment. Because we’re not ready to wait around until the children of the Party of the Regions grow up in the hope they’ll be better than their parents,” said Mr Mindiuk. It is meant to be a political street theatre, a public humiliation rather than a lynching. But the stunts can get frighteningly out of hand. Nestor Shufrych, another MP of Yanukovych’s now disbanded Party of the Regions, ended up in hospital after his campaign stop in Odessa was interrupted by protesters. Police and body guards managed to get the MP to his campaign bus before the mob could dump him in a bin. But a video shows him taking a nasty beating before he made his escape. He later said he received a concussion during the violence. Mr Mindiuk later admitted the group had gone too far, and the incident prompted Arsen Avakov, the Interior Minister, issued a plea via his Facebook page for the radicals to desist. “Just a couple more broken faces like Shufrich’s or lynchings like Pylypyshin, and Europe will turn away from our victorious revolution,” he said. “Don’t be marginal morons, follow stupid instincts and provoke crowds to mob justice,” he wrote. That got short thrift from the radicals, however. Both Right Sector and Mr Lyashko revel in their respective reputations for direct action - and, indeed, violence. But public backing for their tactics appears to be lukewarm. Although polling puts Mr Lyashko’s Radical party in second place at the up coming parliamentary elections on October 26, it is set to take little more than 10 percent of the vote. Right Sector’s leader Dmytro Yarosh took less than 1 percent of the vote at the presidential election in June, and the group does not look likely to make gains.